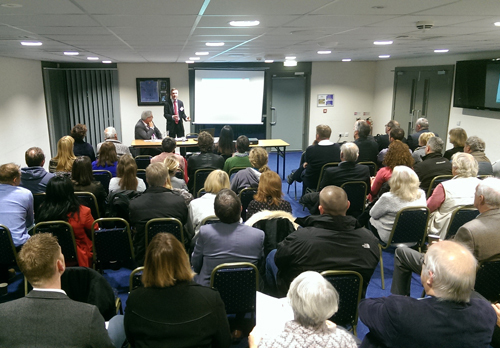 Businesses attending the launch of the Colwyn BID proposal and Business plan at Parc Eirias last week heard from Chris Jackson, Interim Chair of the Colwyn BID Steering Group how the plan provides an exciting opportunity for businesses to influence key issues in the area. 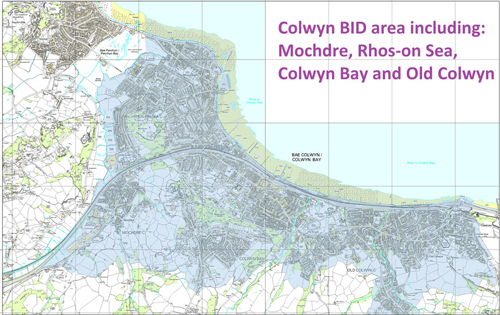 ‘The fact that all four areas are represented in this BID makes it unique in the UK’ said Ian Ferguson ofbid-map500pixels pfbb UK, BID Consultants for the Colwyn BID. The BID Proposal has specific projects for each of the four areas as well as each area benefiting from larger shared projects such as signage and parking. Teresa Carnall of TBC Marketing and Chair of the Bay of Colwyn Business Network reminds everyone to look out for their Ballot Paper. ‘These will be posted to the address where your rates bill would normally go for your business. If you are based at an address which is different please track the ballot paper down and make sure that you can influence the ballot by getting the YES box ticked and the ballot paper returned’. The Ballot paper must be returned no later than 5pm on Thursday 26th November.